Here are some questions regarding connectivity issues of Maryfi software. Install Microsoft Virtual Wi-Fi to your machine. Also be sure that you are using the most up-to-date drivers available for your wireless card. After that restart Maryfi and you will find Maryfi Connection. First of all, you can not find Microsoft Virtual Wi-Fi unless Maryfi is running, so open Maryfi, and if you still can not find Maryfi Connection, be sure that your wireless card is supported (Supported Devices), also be sure that you are using the most up-to-date drivers available for your wireless card. You may find updated drivers via Windows Update. Many times Windows Update does not have the latest drivers and you may need to check with your laptop or wireless device manufacturer to find them. After downloading and run as administrator for installing Maryfi to your Windows 7 computer. You didn't install Microsoft Virtual Wi-Fi to your machine. Also be sure that you are using the most up-to-date drivers available for your wireless card. You may find updated drivers via Windows Update. Many times Windows Update does not have the latest drivers and you may need to check with your laptop or wireless device manufacturer to find them. Nothing happens when I press the button to start the hotspot ? What gives another common issue is the Microsoft Virtual Wi-Fi Miniport driver getting stuck in a bad state. To check for this issue, go to 'Device Manager' (in the 'Control Panel', under 'Hardware and Sound'). Under Network Adapters, there will be a Microsoft Virtual Wi-Fi Miniport Adapter list . If there is a yellow exclamation point on the icon for this adapter, then Windows encountered an error loading the driver. You may be able to fix this by going into the Driver tab of the adapter's Properties dialog (double-click on the entry in Device Manager). On the Properties window, click the Disable button, wait for Windows to disable the device, then click the Enable button to re-enable the adapter. The yellow exclamation point icon should go away, and Maryfi should now be able to start a hotspot normally. First, make sure that you are connected to the Internet and that you made Internet sharing to your actual Internet connection. If you are still having issues, it means you have problems with Firewall. if your firewall software has any settings involving Internet Connection Sharing (ICS), enable support for these. Some firewalls may require full network access be granted to Maryfi in order for it to function properly. it fails with Norton 2011, and ESET Nod32 Smart Security. Try to refresh Network status of the Maryfi software, by clicking on the refresh icon and wait a few seconds. If you are sharing an internet source from a device other than your Wi-Fi card, Windows may be turning off the hotspot device to save power. To disable this, go to the Main window and click on View Network Connections button. 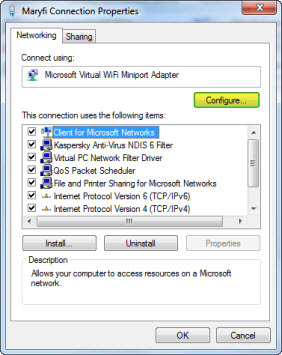 From here, right click on the Microsoft Virtual Miniport Adapter and click on Properties, then click on the 'Configure' button in the 'Networking' tab. 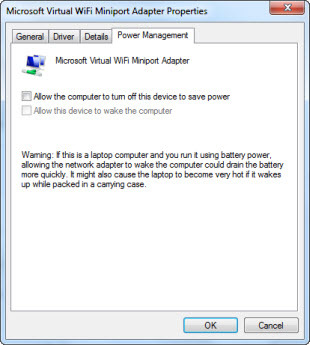 From this window, go to the 'Power Management' tab and uncheck 'Allow the computer to turn off this device to save power'.